The development of biopharmaceuticals is complex and requires extensive characterization to ensure safety and efficacy as products progress towards commercialization. While there are many approaches for assessing comparability, intact mass analysis using LC-MS provides a rapid assessment for the mass of the molecule as well as high level heterogeneity information. The ability to accomplish this assay rapidly often makes it a key assay prior to more extensive investigation. Biosimilar trastuzumab therapeutic was obtained from two different manufacturing sources (labelled, Trast-1 and Trast-2). Samples were either diluted in 0.2% formic acid or deglycosylated using PNGase F (New England BioLabs (Ipswich, MA, USA)) using vendors standard protocol. For this study two different lots of trastuzumab were used. We began with a rapid and simple chromatographic method to deliver a desalted sample for MS analysis. The initial portion of the separation was diverted to waste using the onboard divert valve on the X500B, after desalting the valve was actuated to place the flow in-line with the MS source. Batch comparisons of biologics is important for the manufacturing process, and enabling rapid comparisons of batches or inter-batch studies allows the quality of product to be monitored and maintained. The benchtop X500B QTOF mass spectrometer was developed, for routine analysis of biologics and rapid batch comparison with the BioPharmaView software. 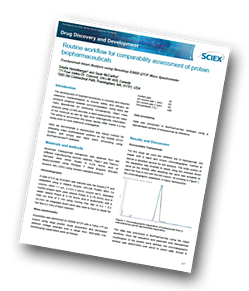 BioPharmaView software was able to rapidly and easily identify the differences between two trastuzumab manufacturing lots based on their distinct glycoform profiles. The visualization tools enable the user to identify, quantify, and track these differences between production lots.